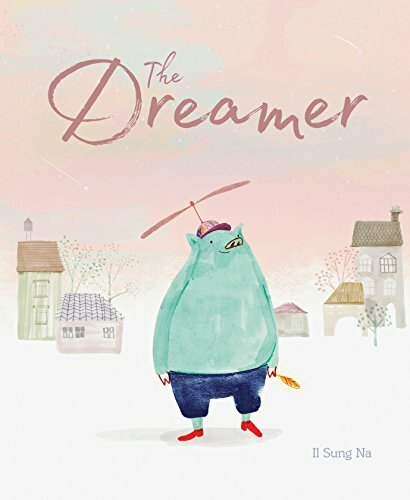 The Dreamer, a spare picture book written and illustrated by Il Sung Na, is clearly meant to inspire young readers to try for the impossible. The main character, a whimsically painted pig admires birds and wants to fly just like them. He tries to fly flapping his arms and when that fails, decides he needs to build a machine to help him soar. The stages of invention are shown with humor and graphic appeal. The art is spare, with a lot of white space on the page for inspiration to gather. From persistence to modification to reaching out to others for help and ideas, the pig keeps at it, focused on his goal of flight. Until one day, in two wordless spreads that convey the energy and whoosh of taking off, the pig does the impossible: he flies. This success isn't the end of the story. Rather, it's the catalyst for what happens next. In an unusual turn to the eternal theme of working hard to perfect an invention, the pig decides he's not satisfied with simply flying—he wants to reach for the stars. This leads to another wordless spread of the pig as a happy astronaut exploring the moon. He comes back to earth to encourage everyone else to reach for new heights. This is where the story begins to feel strained. Just because the pig dreams of flying doesn't mean that's everyone else's ambition as well. Nor is there any sense of satisfaction that a long-sought achievement is finally being enjoyed. Instead, the pig quickly moves on to the next thing. The text reads “Some days everything felt changed. And some things never would.” Deep philosophy perhaps, but not really part of the story. What was changed? a child reader would demand. Now everyone can fly, the parent reader would answer. What does that change mean? Does that mean everyone's dreams come true? Or just that everyone has fun flying? And what are the things that never change? The last page gives an attempt at an answer: “Once there was a pig who admired birds.” The last sentence echoes the first one that opened the book, but in this case the circular journey, coming back to where we started, doesn't feel satisfying. It feels odd. The pig still admires birds, but that whole concept was lost through the turning pages where the focus wasn't on birds themselves but the ability to fly. The Dreamer is a charming story that falls flat at the end, exemplifying in its own structure the potential and pitfalls of reaching high. What happens when a dream comes true and you don't really know what to do with it? Where is the satisfaction in that? Should you just go back to dreaming? That's what seems to be the ending here.